Throwing a team building party is a great way for people to get to know each other and become more acquainted with the people at work! 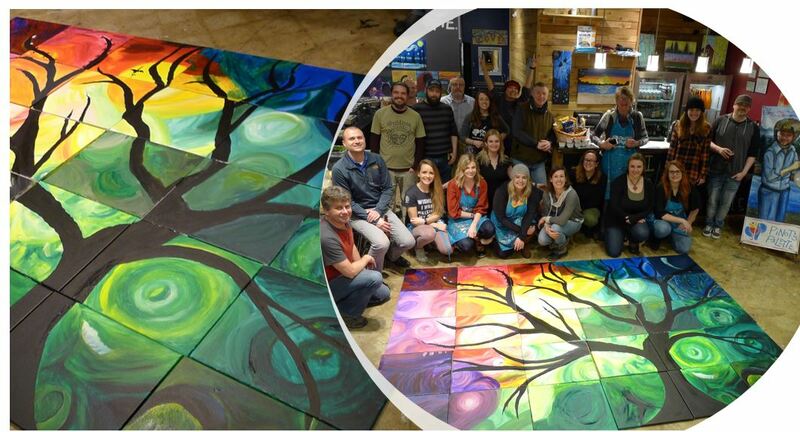 These pictures are from a recent team building party we hosted, where the group did a "Jigsaw" painting. Everyone painted a different piece of the puzzle on their canvas, and then they all put their paintings together to make a beautiful mural by the time they were done. It's so cool to see these paintings and how all of the pieces come together, just like how every team member is unique and has something to offer that contributes to the whole! Mystery Painting - The final product is a complete surprise to the group! The instructor teaches the class step by step how to do the painting, but doesn't give away what they are painting until everyone sees it for themselves by the time they are done. Musical Chairs - A painting is broken down into multiple steps, and after each step, the participants change seats and work on a different canvas. By the end, everyone will have contributed to each other's paintings! Custom Paintings - You can commission a painting of anything you would like, and have one of our professional artists create it for you and teach your group how to paint it. You can pick something significant to your team, and they will love it!